Anyone who keeps up with news from Burning Man through the JRS (Jack Rabbit Speaks) or the new BurningMan.org website, has probably read about the 2015 festival theme: Carnival of Mirrors. While getting a handle on the 2014 theme required me to do some research, the Carnival of Mirrors theme is one that has not taxed my brain to understand its meaning. In fact, I’ve talked to a lot of people who immediately thought of “American Horror Story: Freak Show,” the Emmy award-winning television series on the FX network. 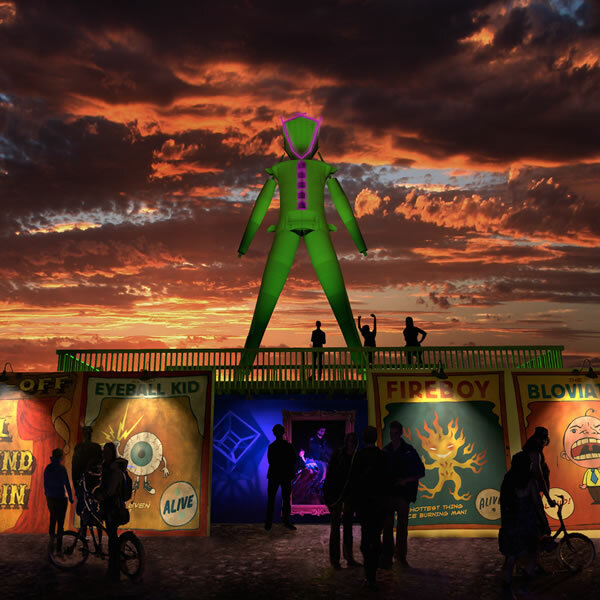 We can hope for a touch of craziness at Burning Man’s Carnival of Mirrors without going into the macabre level of Freak Show (which is both weird and wonderful from my perspective). I think the Burning Man org has hit on something ideal as a theme for 2015 in that reality and distortion are so totally intermingled at Burning Man. Looking at yourself all costumed up for a night on the playa is a bit like a glimpse into a side-show mirror. It’s hard to know whether you’re seeing the real you or an aberration. I prefer to think of Burning Man as a week-long aberration of real life, but one that represents an ideal rather than a horrific distortion. I’m willing to be so much more than my usual self at Burning Man, in part by absorbing and becoming part of a community that is unique in the world – or at least in my world. So I look forward to attending the “Carnival of Mirrors” in 2015, and seeing whatever there is to see about myself and everyone else. Another topic covered in JRS and on the Burning Man website is “plug and play” camping and whether it has affected the nature of the festival. One interesting aspect of these fully concierged approaches to attending Burning Man is that I never noticed them. In part that’s because all the big, well-equipped busses serving as luxurious locales for people willing to spend large sums of money to be taken care of, were simply too far away from Lamplighter Village for me to notice them. But I’d like to highly recommend to all of the readers of this site that “plug and play”BM-2015-Carnival-of-Mirrors.jpg camping is not an ideal way to experience Burning Man. Being “protected” from the Burning Man environment is exactly the opposite of what you want from your week in the desert. It’s undoubtedly tempting – if you have the money – to let someone else take care of all the planning and preparation. But that planning effort is part of what makes your personal experience complete. As Larry Harvey pointed out, there’s nothing about these camps inherently against Burning Man’s 10 principles (in fact, radical inclusion calls for full acceptance of both the rich and the poor, the basic and the elaborate). But what Larry clearly objected to was creating a gated community out of some of these camps. Walling off one camp from the rest of us Burners is the antithesis of Burning Man, and, given the people’s ownership of the land we use, it seems wrong on almost every level. But it’s important to stress that the majority of plug and play camps made no attempt to close themselves off from the rest of the Burning Man community. Rather, they offered people the possibility of attending when they might not have the time or ability to make their own preparations. I don’t recommend it, but I can understand – within limits – allowing it. One of the reasons I have no desire to participate in such campsites is that it undermines part of the experience we’ve enjoyed so thoroughly – preparing our own materials, decorating our own bikes, and being part of an open community that welcomes all Burners into our lounge and as volunteer Lamplighters. As an older Burner, I think I would feel less of the invigoration I receive from Burning Man if I became too reliant on others to take care of me. When I’m that old or disabled, I’d choose a different approach to managing my way through the process, or I’d simply stop attending.